Amazing Curly Scarf - free pattern below. Want less ruffles? Check out my Potato Chip Flutter Scarf! 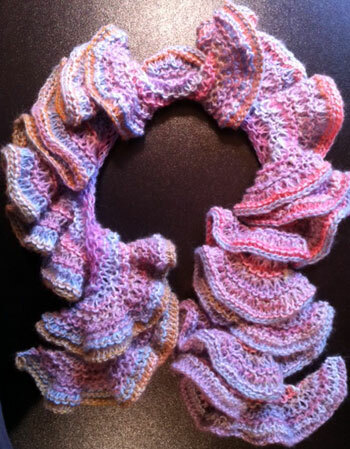 I've knit a few spiral scarves over the years, and they remain one of my favorite knits. How cool is it that your fabric begins to spiral right before your eyes as you bind off? And the best part - it is so easy to do! Also called a corkscrew or potato chip scarf, you can use just about any yarn and needle size you like. The secret, or trick, to making your scarf spiral is in the increase rows. That's it! I do recommend using at least a 32 inch circular needle - you will start out with relatively few stitches and in the end will have hundreds, or even 1,000 stitches that need to fit comfortably on your needles. All you have to do is cast on a certain number of stitches, let's say 100. Knit two or three rows; then you will do an increase row to double the number of stitches you started with. Simply knit into the front and back of each stitch (you could even make YOs if you don't like knitting into the front and back of your stitches) - so if you started with 100 stitches, after the increase row you will have 200. No need to count to make sure you have exactly double the number. A few more or less isn't going to make much of a difference. Now, knit some more plain rows - however many you knit before, whether it be two or three. The most I have used between increase rows is three, so while I am sure you could do more, I can't vouch for the looks of the scarf in doing so or the effect this would have on the spiral. Do another increase row, again doubling the number of stitches on your needles. Continue in this manner until you have roughly 800-1,000 stitches. I say roughly, because the needle size and weight of yarn you use will affect how long your scarf ends up being. A word of warning though - do remember that as you increase the number of stitches, the length of your scarf will also increase. One of the first spiral scarves I knit ended up with close to 2,000 stitches, and was about 12 feet long. That is much too long for most folks!! Obviously, if you are using a lace weight yarn and small needles, you will need more stitches to get an appropriate length on your scarf; if you are using a larger needle and bulkier yarn, you won't need quite as many stitches. Below is a video in which I knit the above scarf. If you would like to knit the same, here is the pattern (click the picture to go to Craftsy to download the pattern). Or try here. I watched your vid on YT and then came to get the pattern. This will make great lunchtime knitting listening to my audiobook. Thanx for sharing the pattern. I love it made in Amazing, too. I didn't realize that Amazing was so pretty and fluffy. It looks to be the perfect yarn for it. You're so creative. Here give a Some of the more plain knit row however many knitting before,either two or three.I add the line between the three most frequently used,and I believe you can do more, I can not guarantee to do so scarf or effect, which will spiral appearance. There is an easier way to do this. Cast on 20(4) stitches. *K8(10) twist K8(10), K6(8) twist K6(8), K4(2) twist K4(2), K20(4) repeat from* until desired length. You can increase using the #s in parenthesis. what do you mean by twist?? Hey Nikky....what do you mean by twist? I plan to make both versions. Like another said...great lunchtime knitting.. I'm using this pattern but I wanted to make the scarf a little thicker, so I doubled the knits.. cast on 40, k20 twist k20, k16 twist k16, k12 twist k12, k8 twist k8 and repeat. Do you think this will work? Wow, the pattern of the scarf really looks nice and it gave me some idea to start my knitting work. Thanks. Do posting!! If the pattern is followed exactly as written, what is the approximate length of the scarf. thanks for ur instruction. i made it but mne 1 seems too short abt 30 inch only. it is tis length suitable for children? How would you knit this to make the lenght longer? Try casting on more stitches to begin with, or do more increase rows. If I keep increasing throughout the scarf, won't the end of the scarf be way bigger than the beginning? No. The width increases evenly along the length of the scarf. You can get that information by clicking on the picture above of the scarf. That will take you to Craftsy where you can download a PDF of the pattern. How many stiches should I start with, and how many should I end with, for a scarf meant for a 1 year old baby?